The Cluster mission is the first ‘Cornerstone’ of the European Space Agency (ESA) in its Horizons 200 Science Programme. 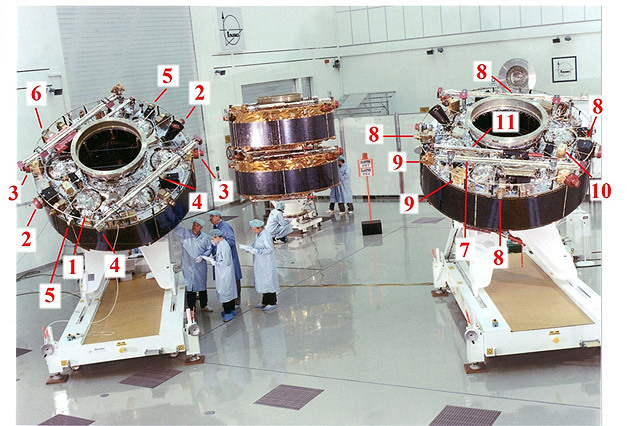 It consists of 4 identical satellites, launched in two pairs in August and December 2000, using Soyuz rockets from Baikonur (Kazakhstan). The scientific objectives of the mission focus on studying the interactions of the Solar Wind and the Earth’s magnetosphere and its different regions and boundaries. These were explored in detail thanks to an orbit evolving during the mission with a perigee of 400 km and an apogee of 12 Earth radii (80,000 km). Artist’s impression of the 4 Cluster spacecraft. Credit image ESA. 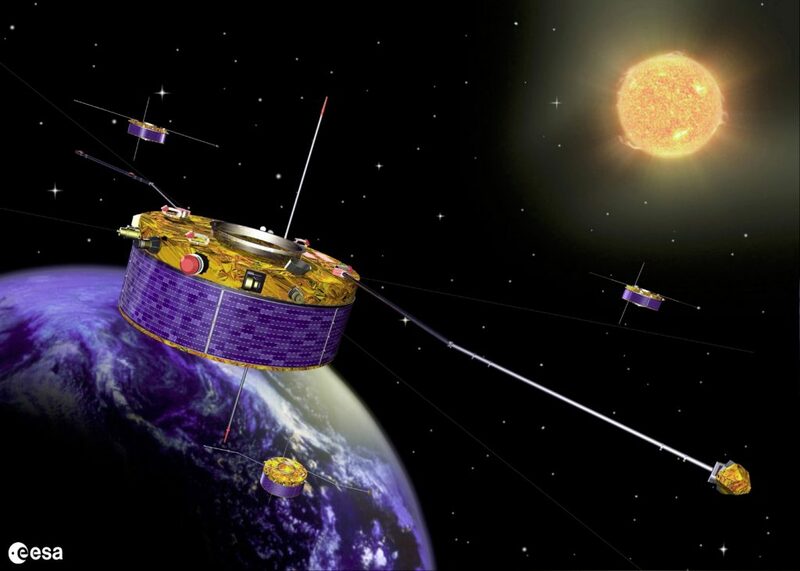 Each satellite, with a mass of 1000 kg, carries eleven instruments dedicated to measuring continuous and alternating electric and magnetic fields, as well as electron and ion populations. Satellites instrumentation and associated measurements: ions, electrons (2, 5, 6), magnetic field (4), electric field (3, 8), electromagnetic waves (7, 9, 10, 11), satellite potential control (1). ). Credit photo ESA. WHISPER (Waves of HIgh frequency and Sounder for Probing of Electron density by Relaxation) is one of eleven instruments on board each of the four Cluster satellites. 1) To measure the fluctuations of the high frequency electric field in the band [2-80 kHz]. These fluctuations can be of local origin (electrostatic waves) or associated with distant sources (electromagnetic waves). 2) The measurement of the electron density of the surrounding plasma. The technique used is the relaxation sounder technique, which consists in exciting the local resonances of the plasma by emitting a powerful electric pulse at very specific frequencies. The spectral analysis of the medium response and the identification of resonances allows the estimation of the electron density, a key parameter of plasma, with an excellent precision. This measurement provides access to local density gradients and the spatial distribution of electrons in the different regions of the Earth’s magnetosphere. In addition, due to its absolute nature, this measurement is used for the recalibration of particle instruments and Langmuir probes. Example of plasma signatures, measured by the WHISPER instrument, for different regions of the magnetosphere. The design and engineering of WHISPER was entirely carried out at LPC2E. The instrument consists of an electronic box, coupled to the satellite’s electrical antennas (80m long). It manages the transmission, the reception and the on board real time analysis of the signal. After more than 15 years of mission, the four WHISPER instruments continue to operate nominally and the data, distributed to the international scientific community through the ESA Custer Active Archive is actively exploited.